What’s worst than someone listing to your conversation? A few stories have emerged about Nest Home Security breaches. One family was spied on and the adult female resident was verbally harassed (due to racially insensitive comments, authorities are investigating the case as a hate crime). A second family was convinced that a nuclear strike was imminent and a missile was en-route from North Korea. As silly as that may sound, it would also seem plausible with the current President of the United States in office. There’s also a glitch in Apple’s operating system that allows those involved in group facetime to eavesdrop on someone without them ever answering or accepting the facetime call. Tech can be intrusive on many levels (app companies sell our data, monitor our usage and package that information to advertisers and don’t sincerely seem remorseful when hacked and user data is stolen), but we allow it because it’s seen as making our lives easier despite the pains. “There’s an app for that” was one of the most popular sayings when that marketing campaign ran in 2009. Why, because it’s the promise that easier translates to better, which is not always the case. Honestly, there’s a learning curve to using tech effectively and efficiently. That learning curve can be seen as just another thing to do…alone. Tech, although a blessing on many fronts, is a great divider. For example, you can use an app to track your exercise routine instead of linking up with a work-out-buddy. I’d personally choose the work-out-buddy. Working out with someone is proven to increase production and it’s companionship, something that we all crave. 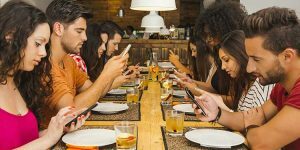 Apps cause us to miss out on human contact and with that, we’re actually disconnecting. I recall friends mentioning that they knew what others were up to only because of social media posts. I don’t entirely know how I feel about learning intimate matters through social media posts. I’m happy when the news is good but it doesn’t feel like the best way to find out someone has passed away, with the funeral details in a timeline. Are we losing our sensibilities and emotional intelligence as we stray from human contact? One thing I know for sure is, hanging out has never looked so different.